There were a number of taverns in Fenchurch Street including the Kings Head and the Elephant. This tavern is three stories high, with mullioned windows and a arched doorway. The handwritten note accompanying the drawing states ' The Sign of the Rose in Fenchurch Street as it was in the year 1730. 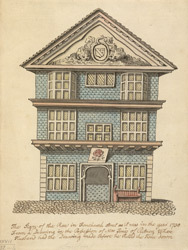 From a Drawing in the Possession of Mrs Jones of Putney whose Husband had the drawing made before he pulled the House down'.